One of the world’s largest corporate golf events – the UAE World Corporate Golf Championship – took place for the first time at Ras Al Khaimah’s world-class golf course, Al Hamra Golf Club, on 13 May. Ras Al Khaimah has hosted several high profile golf tournaments over the past year, reinforcing its position as a leading golfing destination in the Gulf region. Jeff Glasgow and Simon Earl took first place at the eighteen-hole tournament with a score of 62 combined stableford points securing a spot at the World Corporate Golf Challenge World Final in Cascais, Portugal from 21-26 June 2016. Jeff & Simon will fly business class with Qantas via London to Lisbon and will play against the other tournament winners from 50 countries worldwide. In addition to this there was some fantastic on course prizes, in cluding a BMW Z4 car for a hole in one which unfortunately went unclaimed. Mark Rix won the Nearest the Pin sponsored by Palmers, Roman Hawczak won a nearest the pin sponsored by Fine & Country Golf, Omar Dobouny won a NTP sponsored by Hydroturf, Ghazi Aurangzeb won the NTP in 2 sponsored by Harradine Golf, Krishnan Subramanian won the NTP in 2 sponsored by event organisers OnCourse Golf and finally David Minchin won NTP in 3 sponsored by Double Tree by Hilton Hotel, Marjan Island. Ras Al Khaimah Tourism Development Authority sponsored the event and even put forward its own team to compete against the other 25 teams involved. Other contenders included teams from Fine & Country, AGMC BMW and Harradine Golf. With a full field of players taking part in the tournament, the event was a huge success. As well as offering a competitive sporting experience, players also enjoyed a gala dinner at the DoubleTree by Hilton, as part of their entry. Steve Rutter CEO of OnCourse Golf said “The World Corporate Golf Challenge is reputed as being the largest golf event in the world and it gives me great pleasure to work with the RAK Tourist Development Authority in bringing the UAE qualifier for the event to RAK and Al Hamra golf club held on the 13th of May. Working closely with the RAK Tourist Development Authority and Al Hamra golf club and also the Double Tree Hilton Hotel, this was one of the largest corporate events on the UAE calendar. The winners of this event will be flown compliments of Qantas in business class via London to Cascais in Portugal where they will participate in the world final playing against over 50 countries from around the world. Not only will they represent the companies they are working for but they will also represent the UAE which is a great honour. 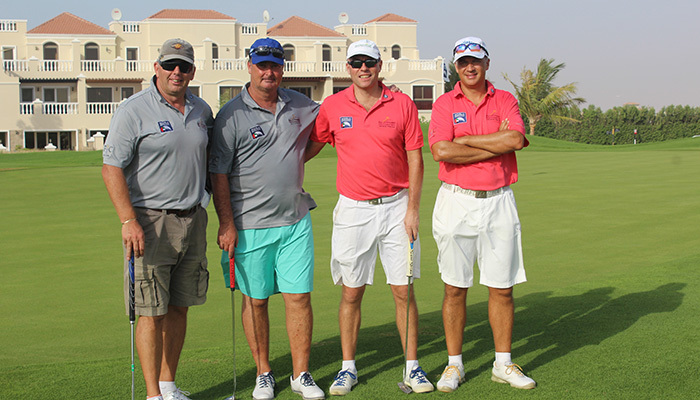 Rutter also paid tribute to the fantastic support of all the additional sponsors, Qantas Airlines, Palmers, Harradine Golf, Hydroturf, Daman Investments, AGMC BMW, Fine & Country Golf, Double Tree by Hilton Hotel Marjan Island and event organisers OnCourse Golf. The UAE team will be competing against Angola, Argentina, Belgium, Brazil, Canada, Chile, China, Cyprus, Dominican Republic, England, Finland, France, Hong Kong, India, Indonesia, Italy, Kazakhstan, Luxembourg, Macau, Mauritius, Nigeria, Pakistan, Poland, Portugal, Russia, Scotland, Slovakia, Slovenia, Spain, Sweden, Turkey, Uruguay, Venezuela and Wales, at the World Corporate Golf Challenge (WCGC).